Michael was trained at the prestigious Mosaic Art School in Ravenna, Italy by Maestro Luciana Notturni and her colleagues. His work has exhibited nationally and internationally most recently at the 2017 RavennaMosaico Festival in Ravenna, Italy. His work has won awards at the annual “Mosaic Arts International” exhibits in 2010, 2011 and 2015 as well as appearing in several art and mosaic publications. 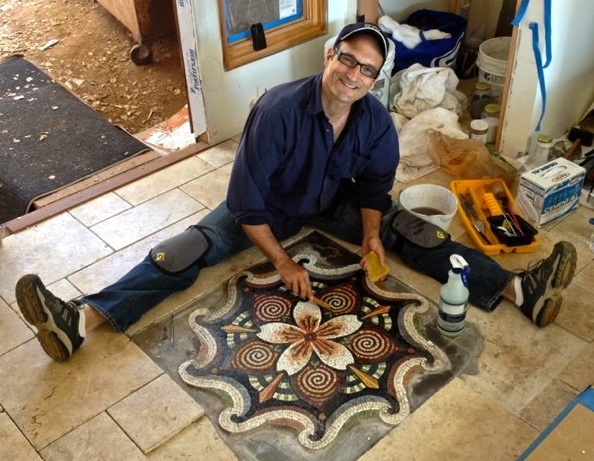 A professional member of the AIMC: International Association of Contemporary Mosaicists, Michael is based in San Francisco, CA where he maintains his studio practice creating fine art mosaics, reproductions and commissions for private/commercial clients. He also teaches the classical Italian principles and methods of making mosaics both in his studio and as a guest artist in various mosaics schools around the country. Michael is one of only a few instructors in the U.S. who teaches the “Ravenna Method” a traditional technique still widely used by professionals in Ravenna today. Many aspects of my professional dance and theatrical background present themselves in my mosaic works. They are often characterized by Light, Movement, Energetic Visual Dynamics and a high level of Detail. These are the what turn me on and motivate me the most. I seek to create a visceral experience. An energy, a feeling, a mood or inspiration. “Meaning” is left to the individual viewing my work. I do not dictate “meaning”. My work is rooted in the classical Italian mosaic tradition. I have an affinity for antiquity, mythology and the heroic, and my natural attractions lean toward figurative renderings. Whether figurative or abstract, my work is often about fusing those ancient techniques into contemporary themes and subject matters. In seeking to cope with the outer and inner chaos of our world today and an increasingly impersonal technological age, my creations tend to lean the opposite; toward the wonder and the natural beauty I perceive in the world, people and experiences around me. I believe in beauty for beauty’s sake. I believe we need beauty for our own and society’s well-being. I work most often with natural stone, and Italian glass, primarily using ancient techniques developed in Italy before and during the Byzantine period. I find the qualities of these materials, combined with the classical methods, convey a sense of timeless strength, importance and elevation to whatever subject is rendered in this meticulous discipline. Art has been my life’s work. I approach it with great passion, devotion and responsibility. To create an enveloping experience for the viewer is my goal, and in every discipline I bring together many detailed pieces to make up a grand overall impression. My mosaic voice is always developing and I do not seek to confine myself to one style, but rather engage in whatever style of expression is calling and intriguing me at the moment. I take pride in being versatile and exploring new ideas that present themselves as well as mastering the traditional methods and styles that are at the foundation of my work. My work is owned by private collectors as well as private architectural installments.